Many pet owners, show dog and cat owners and other animal lovers are feeding E3 Live™FOR HORSES w/CESM (frozen liquid) and E3 AFA™FOR HORSES w/CESM (dried flakes) to their animals. 1 tsp to 2 tsp of E3 AFA™FOR HORSES w/CESM per day. 2 tsp to 3 tsp E3 AFA™FOR HORSES w/CESM per day. 3 tsp to 4 tsp E3 AFA™FOR HORSES w/CESM per day. 1/4 tsp of E3 AFA™ FOR HORSES w/CESM per day. We recommend a sprinkle a day on food or water. 1tsp to 2tsp of E3 AFA™FOR HORSES w/CESM ™ per day. 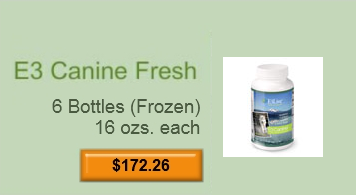 When you see how it helps your animal, you will want to try it for yourself. It is the same high-quality E3 Live™ or E3 AFA™ for both animals and humans, we do not believe in feeding our pets any less quality than we would eat ourselves!